Create a new Objective-C category on the class the private method is defined in (e.g. UIView). Hit Yes if Xcode asks you about configuring an bridging header. (If you have already an bridging header in your project this step will be skipped). The implementation file (.m) of the category can be removed. It's worth noting that Xcode 8 introduced the view debugger (click on ), offering a more interactive way to analyze the view hierarchy, largely eliminating the need for the LLDB recursiveDescription of the view hierarchy. For more information see WWDC 2016 video Visual Debugging with Xcode. Admittedly, sometimes we end up having to fall back to the recursiveDescription technique shown above, but most of the time the view debugger makes this a far more natural, intuitive process. First add a category @interface without @implementation in your bridging header. There is needed enter it in Objective-C format because UIKit is in Objective-C framework. And Swift is a strict language and doesn't allow you to call functions that haven't been strictly defined. Objective-C, it's a dynamic language so you can call functions like this. -O, tell the debugger that we also want the debug description the same as po would do and -- to indicate that there are no more options. We need to put put [self.view] view in back ticks. Back ticks is like a preproccess step that says first, evaluate the contents of this in the current frame and insert the result, and then we can evaluate the rest. My answer is taken from WWDC 2018 Session 412 advanced debugging with Xcode and lldb. 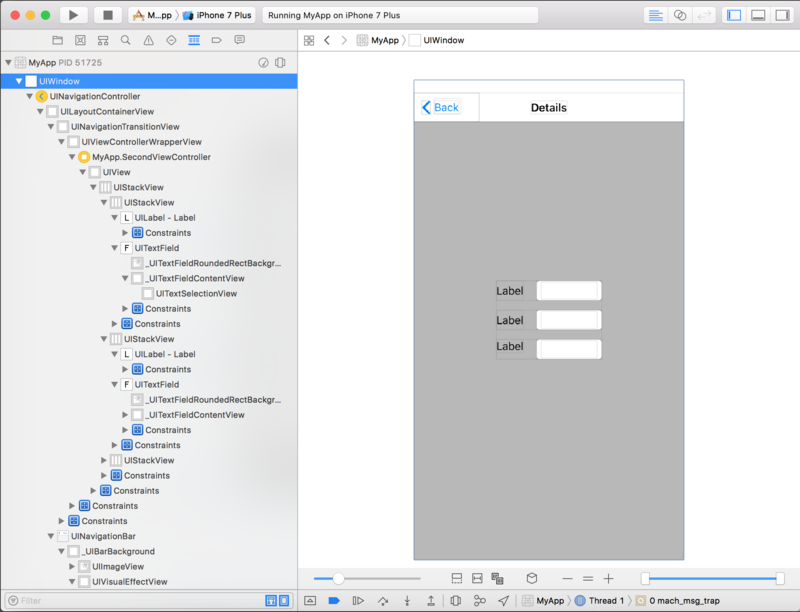 Add to the bridging header a declaration of a category of UIView with that method. Not the answer you're looking for? Browse other questions tagged ios uiview swift ios8 uiview-hierarchy or ask your own question. Is it possible to detect all segues that are associated to a particular View Controller on Swift? The use of Swift 3 @objc inference in Swift 4 mode is deprecated?